akupofkatie: #31day October writing challenge >>> DAY 1! #31day October writing challenge >>> DAY 1! It is day one and I'm already feeling challenged. Gahhh, isn't that the point? All day I've been pondering about what to write about. As I was leaving Whole Foods, listening to the Christian radio station, a listener called in a prayer request. You see, her daughter was on her way to a candlelit vigil for a classmate who had died THIS MORNING on the way to school. 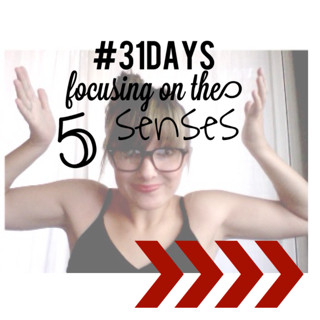 I knew I wanted to write about the five senses during this challenge. I have this thing for focusing on one sense and fiercely paying attention to what I notice, with that sense. I've done it before and often encourage others to do it, too. I've never done it for a month. Straight. I didn't know where to start today. After I heard the radio, I felt. My heart burst with hurt. For the parents. Siblings. Friends. Everyone. I hurt because I knew they were intensely mourning. "Psalms 46:1 God is our refuge and strength, a very present help in trouble." You know, we've all needed comfort at times. I've had trauma, major trauma. I've had the sudden phone call of a lost family member. This short radio talk made me want to squeeze those near and far. It made me want to hug YOU and all that need comfort, now. There are lost who need support and encouragement RIGHT NOW. I feel challenged and want to challenge you. Reach out and comfort somebody. Anybody. If you're one that needs comfort, seek it. And lastly, know that God is the ultimate comforter. Today, my sense of hearing pursued me and CLUNG. whew. I promise every day won't be this intense. Hang with me guys, I'll need it!